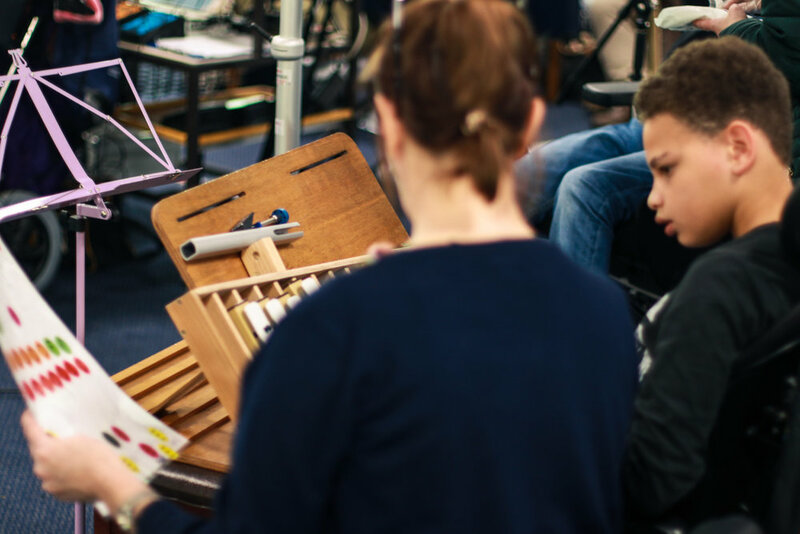 On Saturday 23 February families from across Southampton came together at The Ashby Sure Start Centre to make a whole lot of mess, and a whole lot of noise together at Southampton Music Hub’s free paint drumming workshop. Playing, and splashing, along with songs from The Greatest Showman, Shawn Mendes and more, families turned their hits in to huge pieces of shared art by tapping splashing, smashing and crashing through pools and puddles of paint. 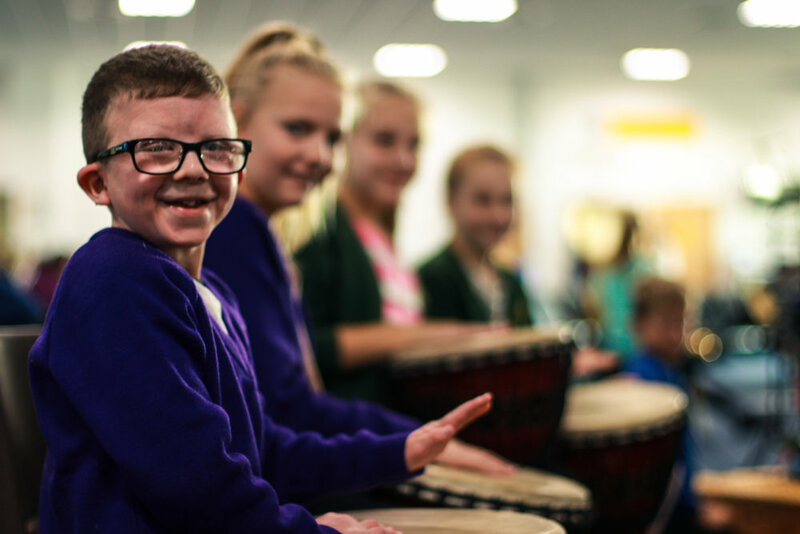 On Saturday 23 February, Southampton Music Hub is bringing an exciting new paint drumming experience to the Ashby Sure Start Centre. Messy + Noisy is a chance for families of all shapes and sizes to come together, to make a whole lot of mess and noise — sorry — music and art. 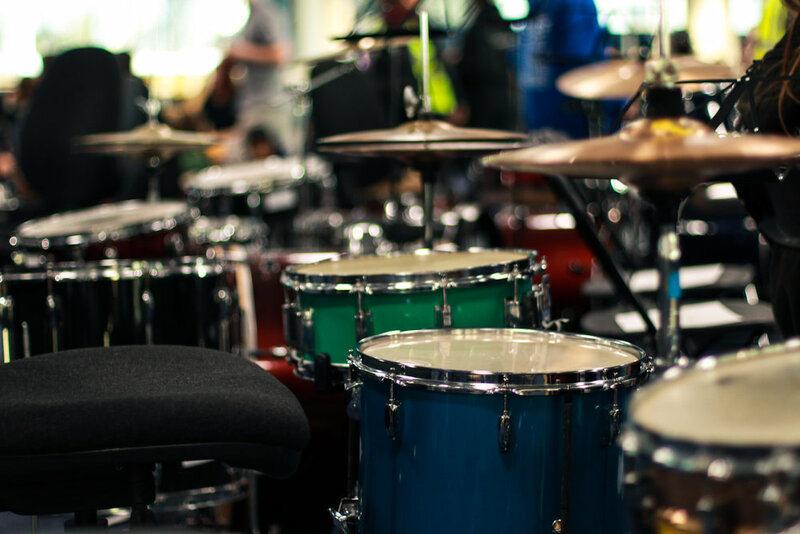 From the young to the young at heart, the Southampton Music Hub team will help everyone learn new drumming skills — turning hits in to huge pieces of shared art. All paint and drumming equipment is provided, but participants are asked to wear clothes they’re happy to get (lots) or paint on. Ukulele is "the best hobby... in my 70 plus years"
When David Martin joined the Sholing Ukulele group two years ago, he wasn’t expecting to find a hobby that would open up a brand new world of music-making. The group, run by Louise Owen, is open to Ukulele players of all ages, and abilities, and introduced David to what he describes as “probably the best hobby I’ve ever had in my 70 plus year”. Since joining the group, David has expanded his musical interest, playing in two other bands, and helping to bring together other community ukulele players. 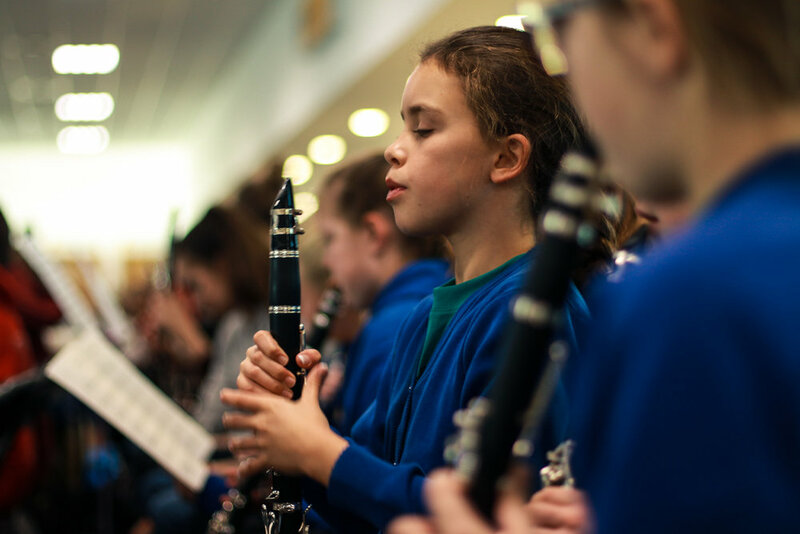 Southampton Music Services, lead partner for Southampton Music Hub, is offering future young musicians the opportunity to get hands on with the Bassoon in a free taster session on Saturday 2 February, from 1.30-3pm, at Woodlands Community College. 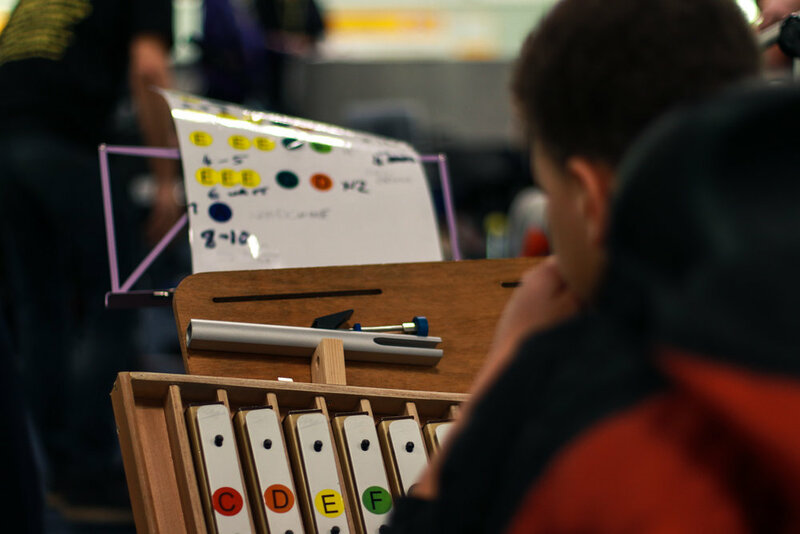 The free workshop is part of the Beyond Ambition programme: with workshops and masterclasses designed to get children and young people playing ‘endangered’ instruments. This hands on Bassoon workshop is ideal for young musicians at the start of their musical journey — those currently learning an instrument with their whole class in First Access projects In2Music or SoundBites — and is also open to any future young musicians who might be interested in getting started on this exciting, and lesser known, member of the woodwind family of instruments. No experience is required. 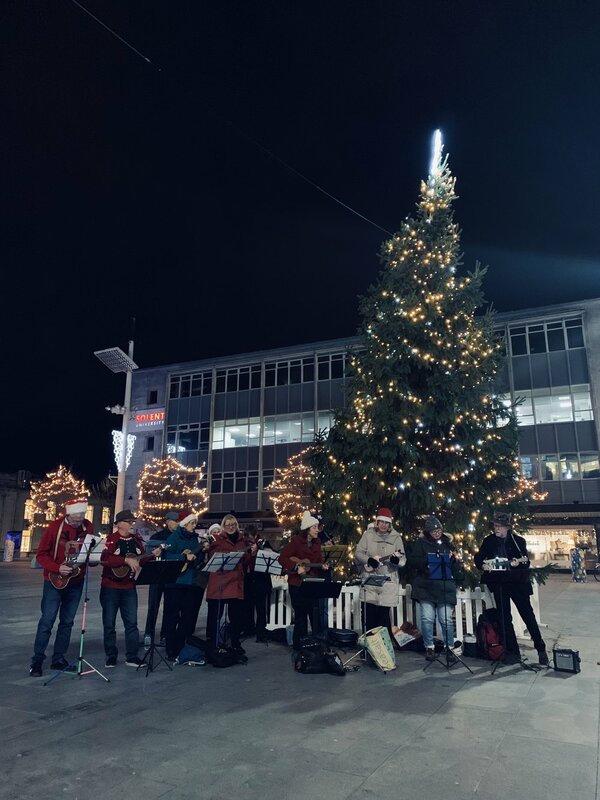 This evening — Wednesday 12 December — Sholing Ukulele Group brought festive feelings to Guildhall Square, rocking around the Christmas Tree with a rousing set of Christmas and festive songs. The performance, from 5.30-6pm, was part of a December music programme organised by Go Southampton, and supported by the hub and Southampton Music Trust. For half an hour this evening — Monday 10 December — St Johns School choir filled Southampton City centre with the beautiful sounds of singing, bringing festive feelings to a busy crowd of parents, shoppers and onlookers. 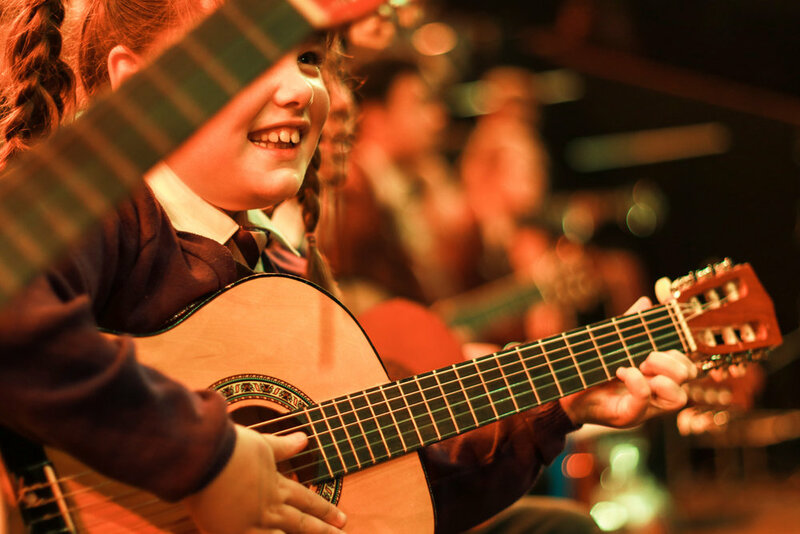 The street concert is the first of five organised in collaboration with Go Southampton and Southampton Music Trust, and will see four city centre spaces play host to music from schools and other young musicians in the lead up to Christmas. From 5.30-6pm, 30 young singers performed a delightful mix of festive classics, carols and family favourites. On Saturday 8 December, Southampton Youth Concert Sinfonia (SYCY) present “It’s Beginning to Look a Lot Like Christmas”: a festive, family concert at Turner Sims, Southampton. Starting at 7pm, the program features family favourites, including music from “The Grinch”, “The Chronicles of Narnia” and a narrated version of “The Night Before Christmas”. 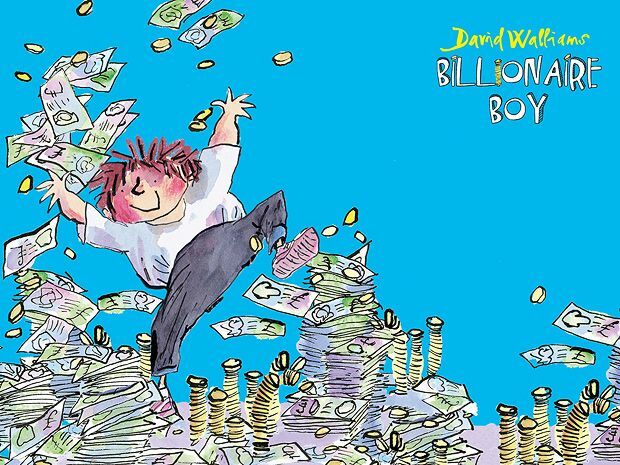 Last night, on Tuesday 201 November, Billionaire Boy — a brand new, hilarious, family-friendly, musical — opened at Nuffield Southampton Theatres (NST). The show, produced by NST in association with Belgrade Theatre Coventry, is based on David Walliams’ best-selling book of the same name, and has been adapted by Jon Brittain, and features music by Miranda Cooper and Nick Coler: the team responsible for huge hits for Girls Aloud, the Sugababes and Kylie. The busy crowd for opening night included teachers and staff from across Southampton school — giving them a chance to see the show ahead of bringing their pupils to see the show later this term — and members of Southampton Music Hub’s vocal team, who will be working in partnership with NST to teach the schools how to sing one of the new songs from this exciting new musical production. Catch Billionaire Boy at NST City, running until Sunday 6 January. On Thursday 16 November, across Southampton City Centre, people gathered to start the countdown to Christmas. In an event organised by Go Southampton, the evening’s entertainment included a performance from Southampton Music Hub’s Brass Bands, the debut of a brand new song from Billionaire Boy (a brand new musical coming to Nuffield Southampton Theatres (NST) next week), the turning on of the Christmas lights, and the debut flight of Southampton’s Flying Santa. 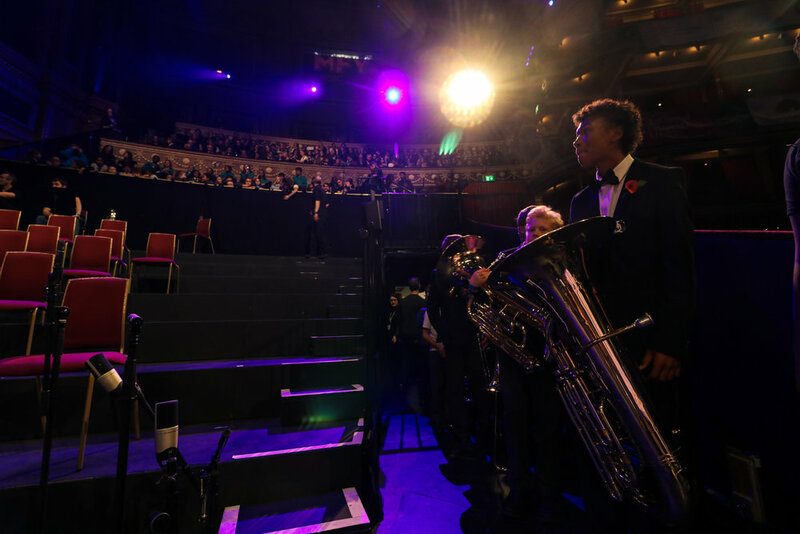 At 7.45pm on Monday 5 November 2018, 600 musicians from Southampton, Isle of Wight, Poole and Bournemouth, alongside Bournemouth Symphony Orchestra (BSO), made their way on to a darkened Royal Albert Hall stage whilst the Azaad Dhol Group performed. Following an introduction from host Remel London, and a brief introduction from composer James Redwood, at 7.51pm, under direction from conductor Frank Zielhorst, the 600 strong massed ensemble hit their first powerful and purposeful note… followed by two more… followed by a further five. Symphony 125 had officially begun. When the last note rung out at just past 8pm, the hall rose to their feet in a show of awe and appreciation. The months of hard work had paid off, and these young musicians had hit heights of achievement that left the audience delighted and amazed. 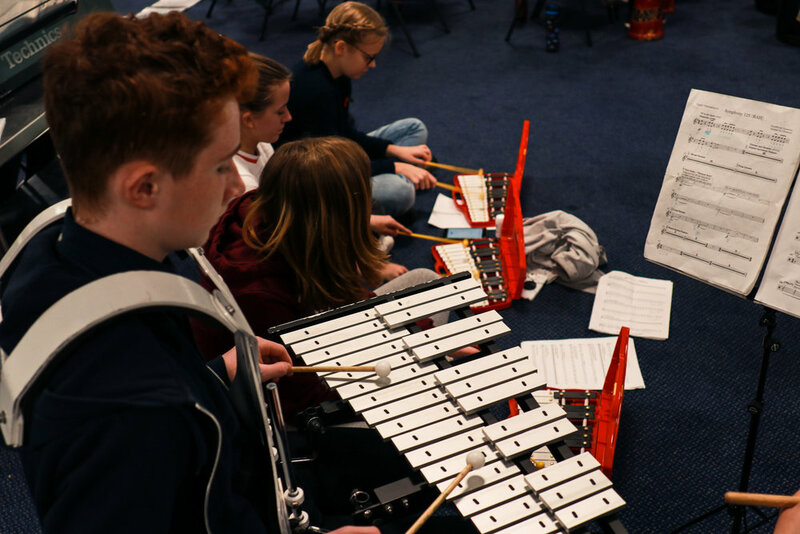 Since September 2018, all involved had been hard at work: young musicians from Southampton Music Hub, Isle of Wight Music Hub and Soundstorm Music Education Agency, coached by their teachers, musical directors and members of the BSO. For all involved, this was the event of a lifetime, and it has only been made possible thanks to a huge community effort: Associated British Ports kindly donated a free rehearsal space; Red Funnel and Solent & Wightline Cruises provided discounted transport; Teachers, musicians, parents and friends all gave countless hours of time and energy to support this momentous event. 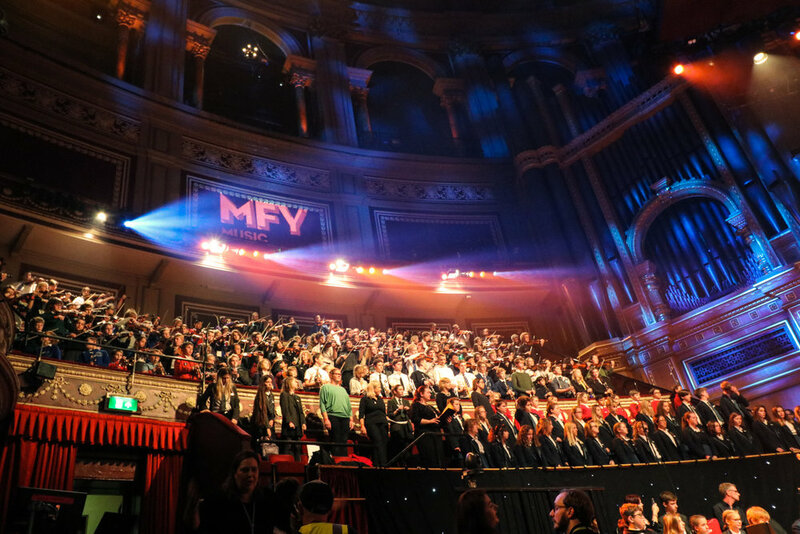 After a morning coach journey to London, all 600 performers from Southampton, Isle of Wight, Poole and Bournemouth have arrived at the Royal Albert Hall this afternoon, ready for their momentous performance of Symphony 125 with Bournemouth Symphony Orchestra at the Music for Youth Proms this evening. For all involved, this is the event of a lifetime, and it has only been made possible thanks to a huge community effort: Associated British Ports have kindly donated a free rehearsal space for all 600 musicians, providing the opportunity to practise together ahead of the big night; Red Funnel and Solent & Wightline Cruises have provided discounted transport, enabling all 200 young musicians (and their friends and family) from the Isle of Wight to make the journey across the Solent; Teachers, musicians, parents and friends have all given countless hours of time and energy to provide rehearsals and lessons ahead of the big night. 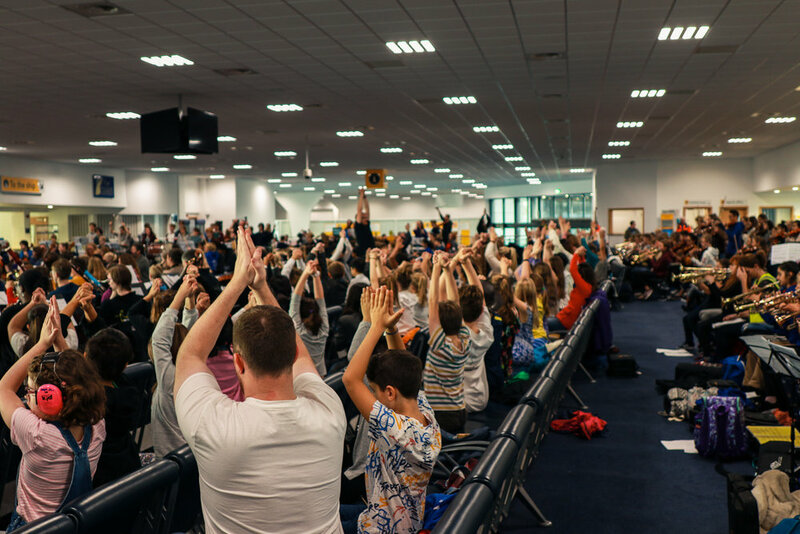 Yesterday (Saturday 3 November) 600 performers gathered at Mayflower Cruise Terminal for an unforgettable rehearsal ahead of their momentous massed ensemble performance at the Royal Albert Hall on Monday 5 November. 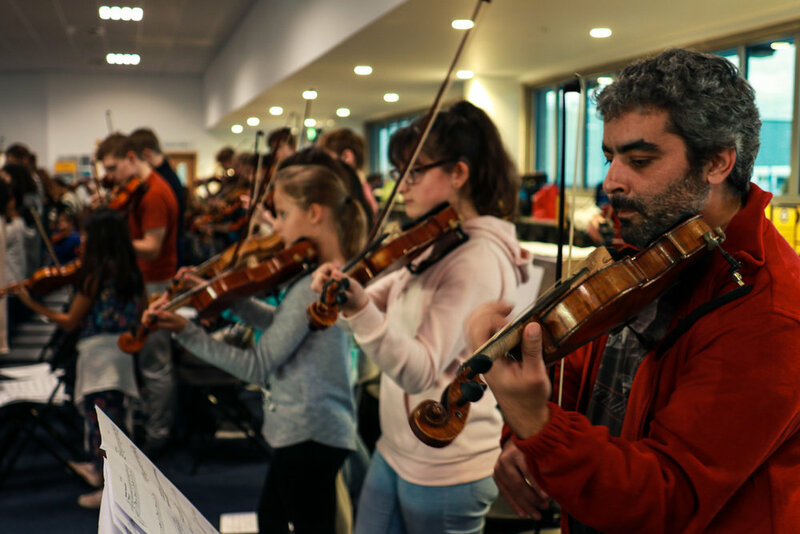 Brought together by Bournemouth Symphony Orchestra, young musicians from Southampton Music Hub, IOW Music Hub and Soundstorm Music Education Agency rehearsed a brand new piece of music — Symphony 125 — written to celebrate the 125th anniversary of the BSO. The ensemble represents a huge diversity of sounds: a wide range of instruments — from iPads to violins to trombones and more; a huge range of ages and abilities — from young singers to high-flying young musicians to members of the BSO; and a broad range of backgrounds — players from schools across the region, including those with special educational and physical needs. 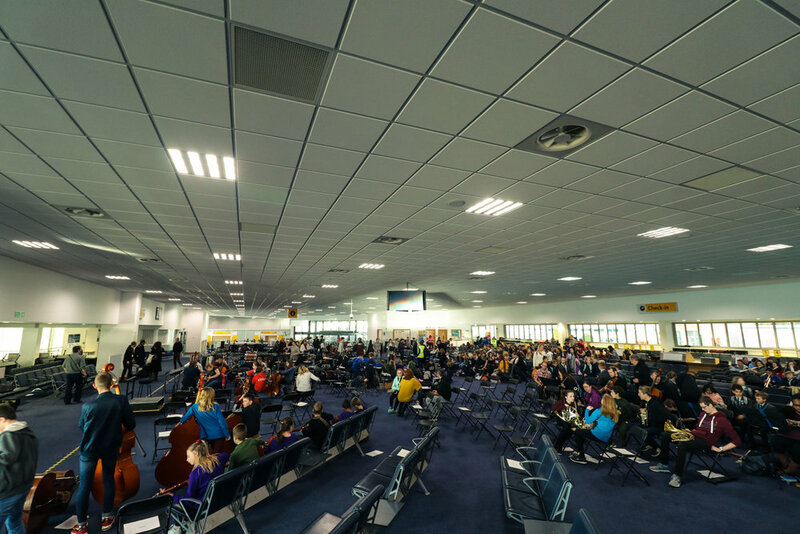 The rehearsal venue for the day — Mayflower Cruise Terminal — has been generously donated by Associated British Ports, enabling all 600 musicians to rehearse together for the day. 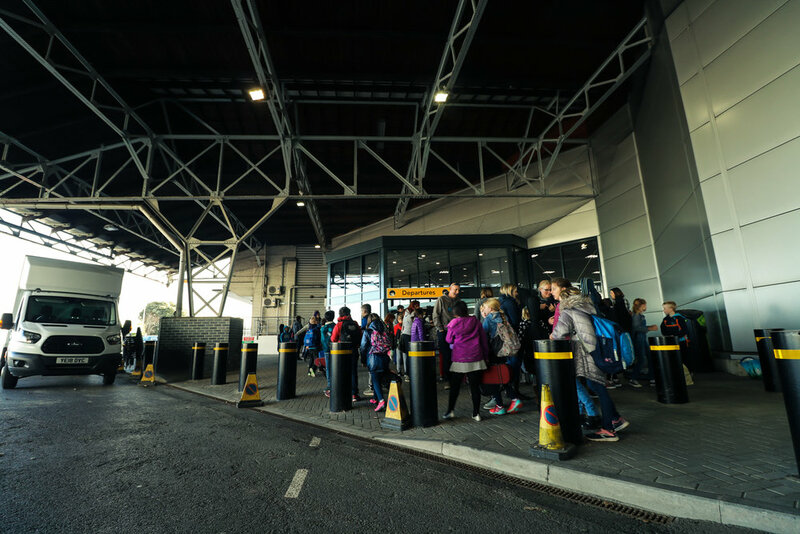 Red Funnel and Solent & Wightline Cruises have provided discounted transport for the rehearsal and Monday event, enabling all 200 young musicians (and their friends and family) from the Isle of Wight to make the journey across the Solent. 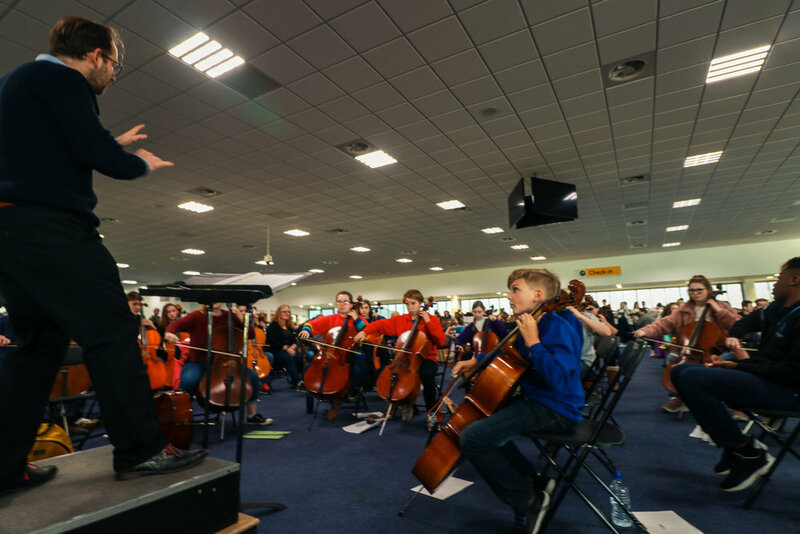 At 10am this morning (Saturday 3 November 2018), Mayflower Cruise Terminal plays host to a massive massed rehearsal for 600 musicians from across Southampton, Isle of Wight, Poole and Bournemouth. 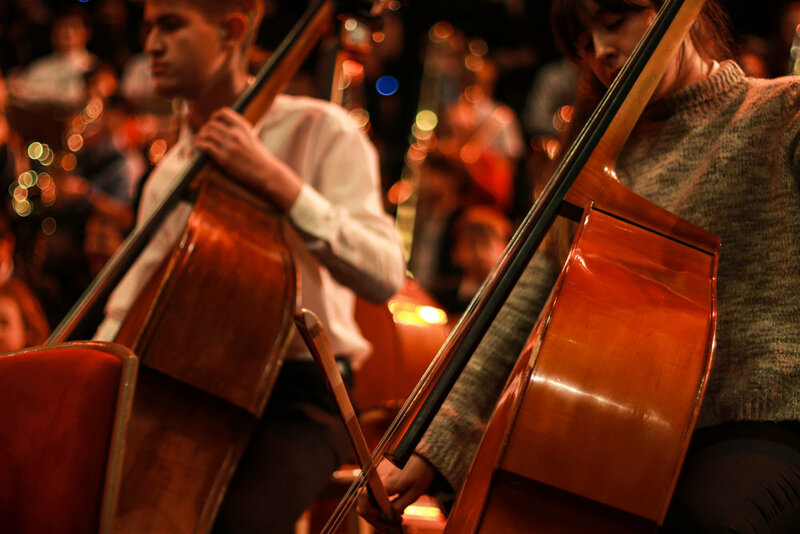 Brought together by Bournemouth Symphony Orchestra, in celebration of their 125th anniversary, they are rehearsing a brand new piece of music — Symphony 125 — which they will perform at the Royal Albert Hall on Monday 5th November. Views over the Solent provide the backdrop to a momentous rehearsal at Mayflower Cruise Terminal. 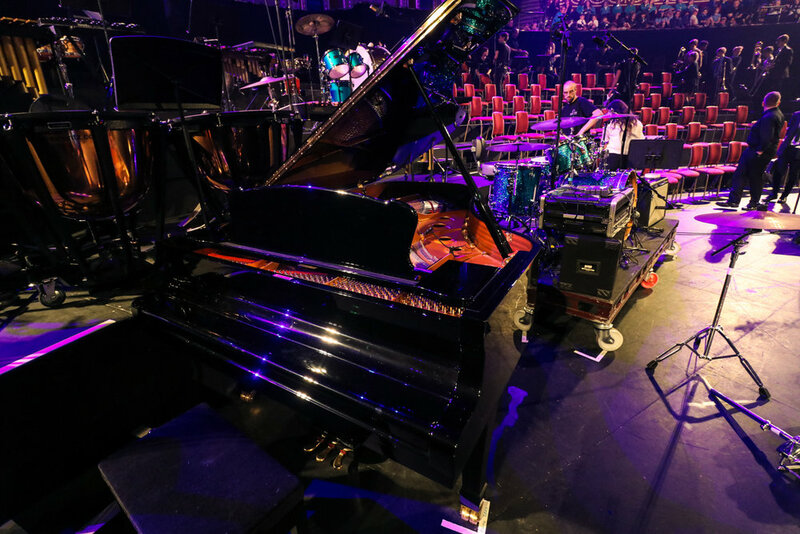 ABP Staff have been helping at the rehearsal, generously donating the venue and their time to help 600 musicians rehearse for the performance of a lifetime. 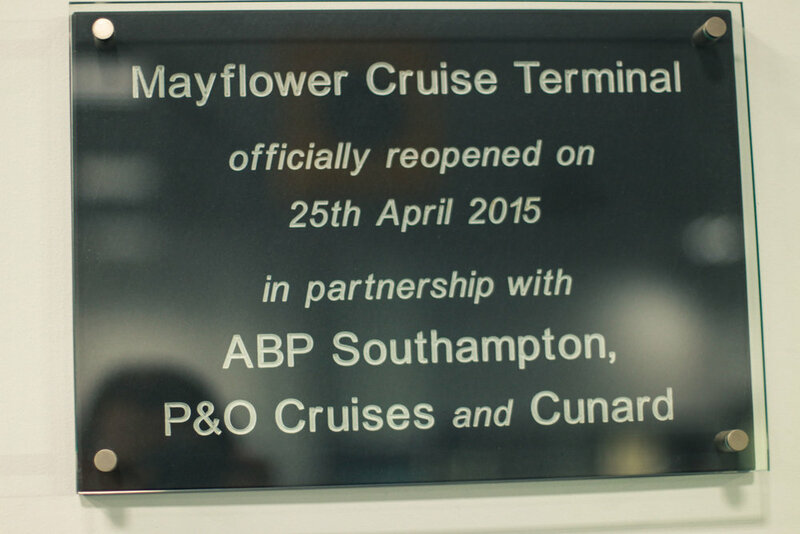 The Mayflower Cruise Terminal has been kindly donated by Associated British Ports (ABP). On a normal working day, the huge departures lounge would be a gateway to the world for cruise travellers. Today, it is the gateway to a once-in-a-life time performance at a world-renowned venue for the performers from across the region. Members of the Family Orchestra rehearse their parts ahead of the massed rehearsal. There are all kinds of instruments being played. This is a photo of an eye-gazer musician practicing his part in a massed ensemble of instruments and voices. 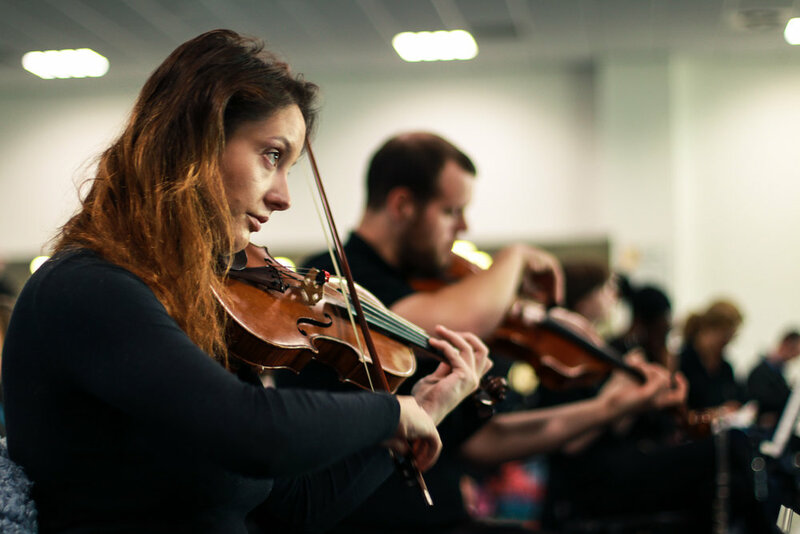 Symphony 125 is a joint project from Bournemouth Symphony Orchestra, Southampton Music Hub, IOW Music Hub, and Soundstorm Music Education Agency. 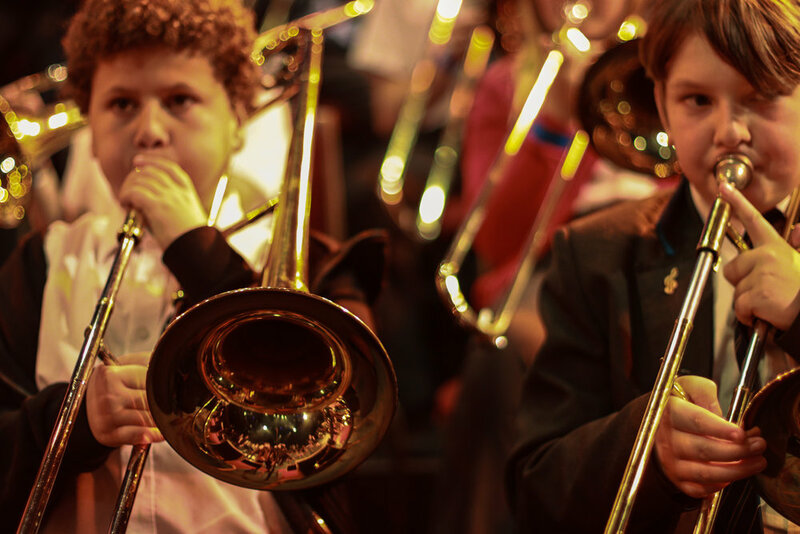 School children from across the city, and members of Southampton’s Family Orchestra will complete a diverse and exciting line up of performers when 200 performers from Southampton join a 600 strong Massed Ensemble at the Music For Youth Proms. Taking place on Monday 5 November at the Royal Albert Hall, this will be the performance of a life time for all involved, including pupils from Upper Shirley High, Shirley Junior, Wordsworth Primary, Hollybrook Junior, Highfield CE Primary, Banister Primary, St Denys Primary, and Shirley Warren Primary Schools. 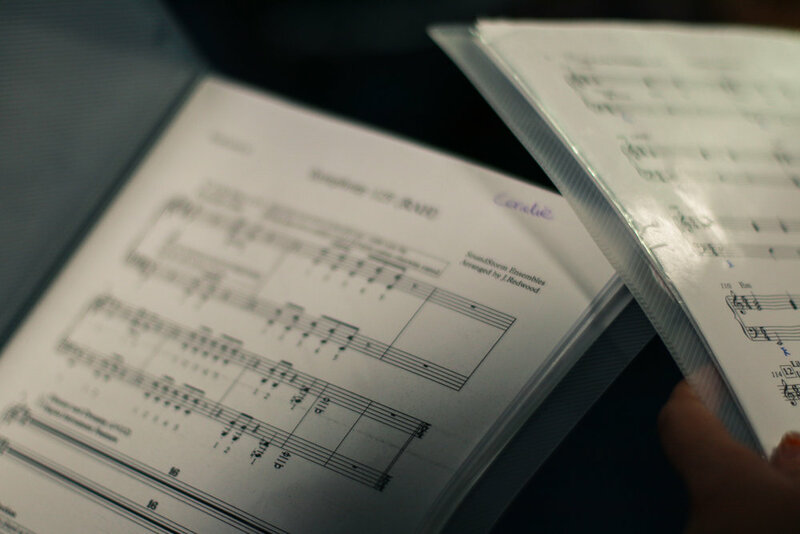 Since September 2018, all involved have been hard at work — coached by their teachers, musical directors and members of Bournemouth Symphony Orchestra — learning the exciting new piece of music which they will all perform together at the Royal Albert Hall. A massed rehearsal on Saturday 3 November will be the first, and only, chance the performers will have to play the piece all together ahead of its high profile public debut. And whilst the buses will return in the early hours of Tuesday 6 November, the fun is far from over. 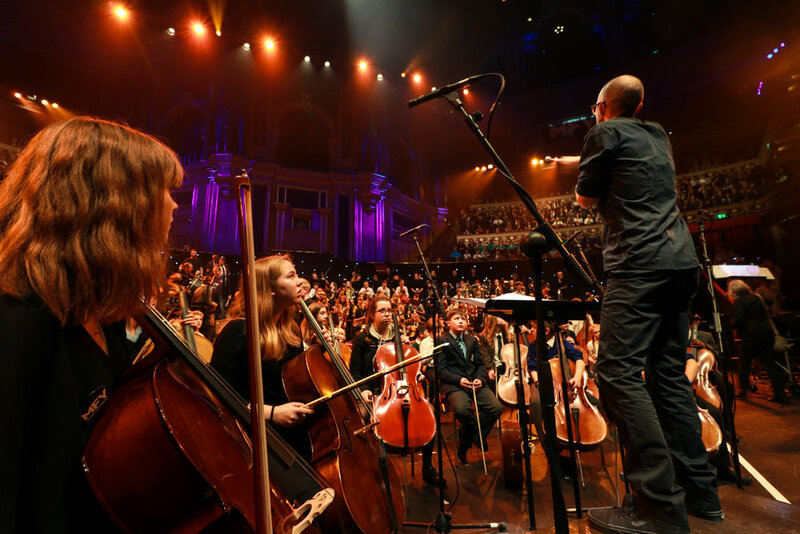 Inspired by the Royal Albert Hall performance, Southampton Music Hub will share the incredible new music from this magical event with all schools in the city. 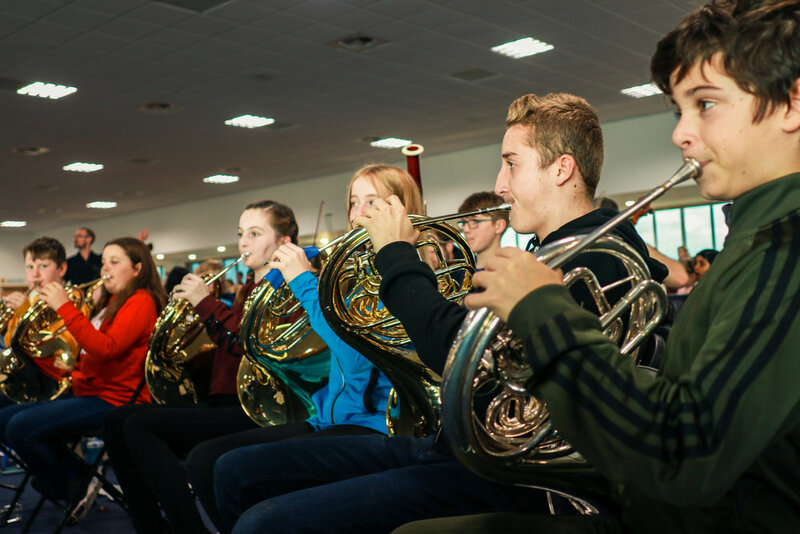 Workshops, performances and event on The Stadium Tour will allow the teachers, musicians and young musicians to share the music, and their incredible experiences, from the Royal Albert Hall throughout the year, leading to celebration events in July 2019. 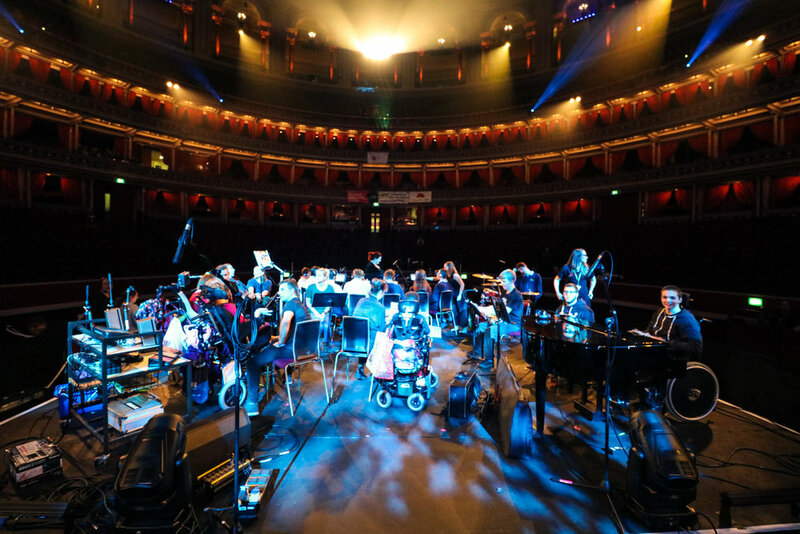 On Monday 5 November, an iPad Orchestra from Great Oaks (a school for young people with a range of complex learning difficulties) will join 200 young musicians from across the city, and 400 more from across the region, forming one of the most diverse Massed Ensemble groups ever to take to the Royal Albert Hall stage as part of the Music for Youth Proms. 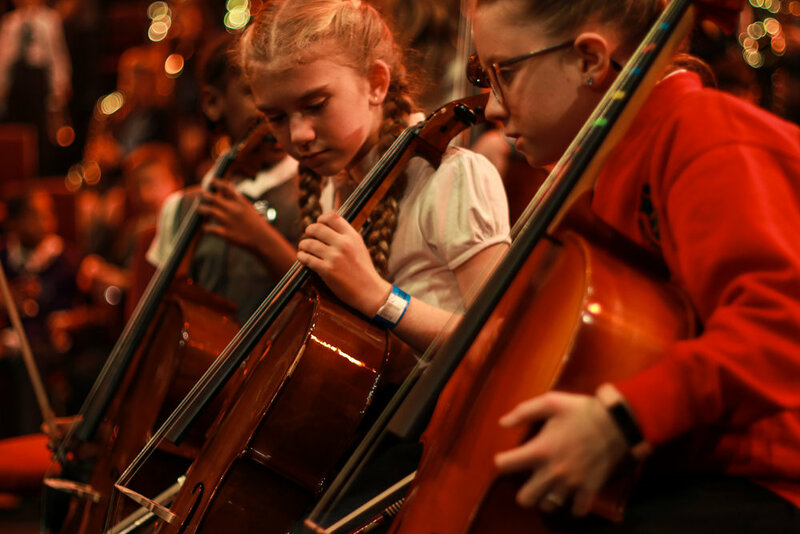 They join a line up which includes some of the city’s most talented young orchestral players, members of Southampton’s Family Orchestra, and singers and musicians from schools across the city. 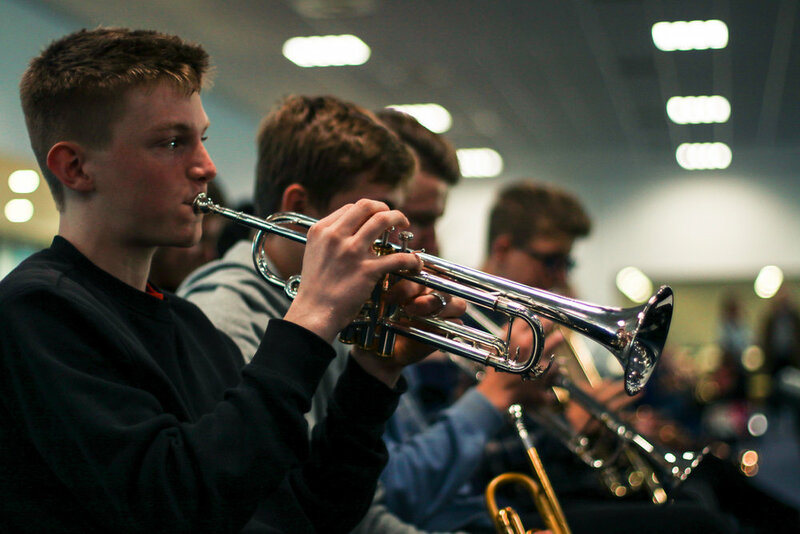 Their performance on Monday night is part of a stellar line up from across the country, as part of the Music for Youth Proms 2018, performing a brand new piece of music by award winning composer James Redwood in celebration of BSO’s 125th anniversary. Shoppers at Southampton’s Waitrose supermarket have the opportunity to support Southampton Music Trust with their green tokens this month. At the end of your shop in branch, you’ll receive a token to place in a box of the good cause you’d most like to support. The more tokens a cause gets, the bigger the donation they receive. Each month every Waitrose & Partners branch donates £1,000 (£500 in Convenience shops) between 3 local good causes that you choose. 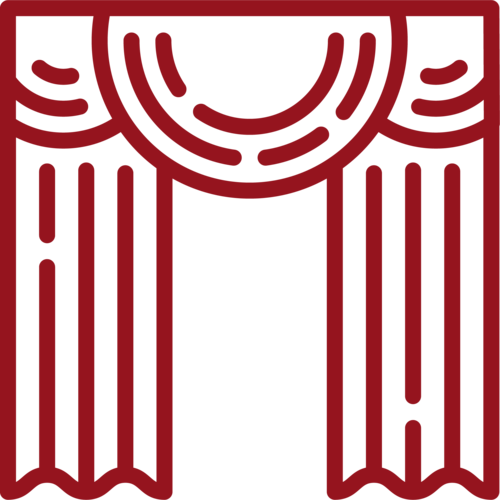 Southampton Music Trust (Registered Charity No. 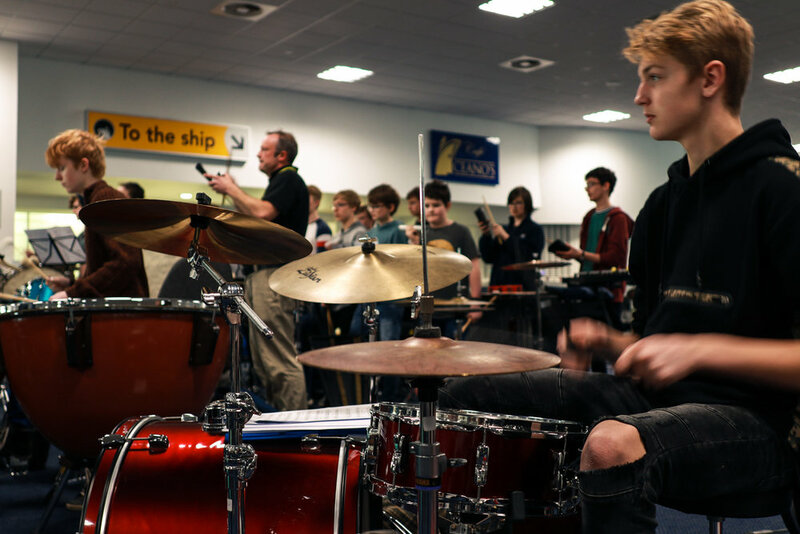 1176179) was set up in December 2017 to support the aims of Southampton Music Hub to improve access to music education and to provide life-changing musical experiences for the communities of Southampton and its surrounding areas. Following on from the fantastic Easter Bunny Hop in spring, a jazz-filled Christmas special comes to Turner Sims. Jingle Bell Jazz is ready to delight families on Sunday 16 December at 11am and 3pm. 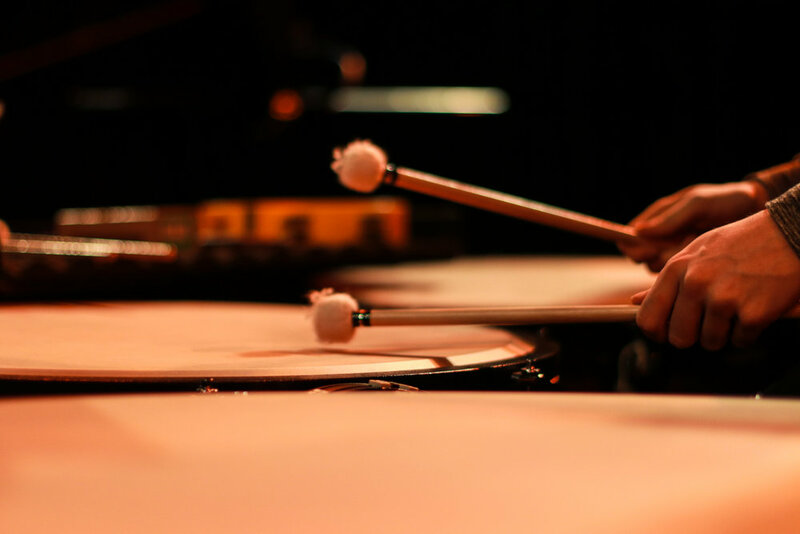 ABC Concerts will get their audience into the festive spirit with everybody’s favourite Christmas melodies played by the Jingle Bell Jazz Band. Audiences can don their Santa hats and reindeer antlers and dance, wriggle, clap, cheer and sing their way through this interactive and fun concert for all the family. Presented by ABC Concerts in association with Turner Sims this show is suitable for ages 2-5, but all are ages welcome. 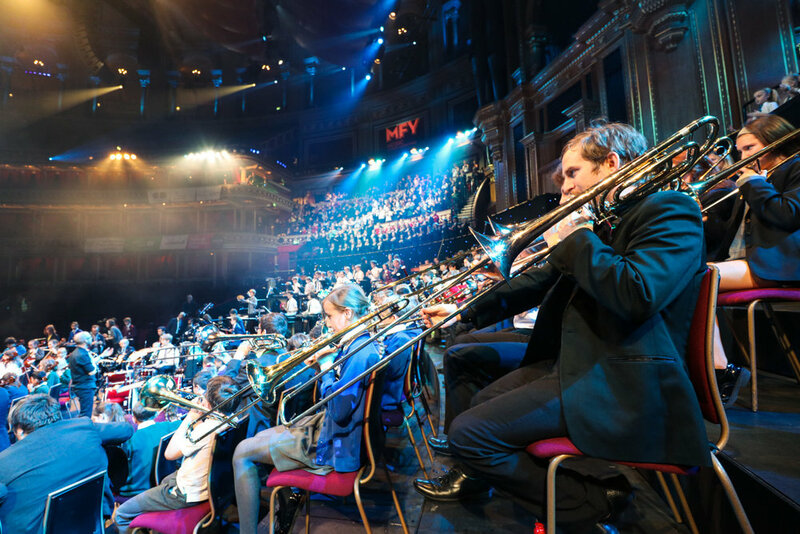 In November 2018, 600 young musicians from across Southampton, Bournemouth and the Isle of Wight will join Bournemouth Symphony Orchestra in a momentous performance at the legendary Royal Albert Hall in London. They will play a brand new piece of music by award winning composer James Redwood in celebration of BSO’s 125th anniversary. 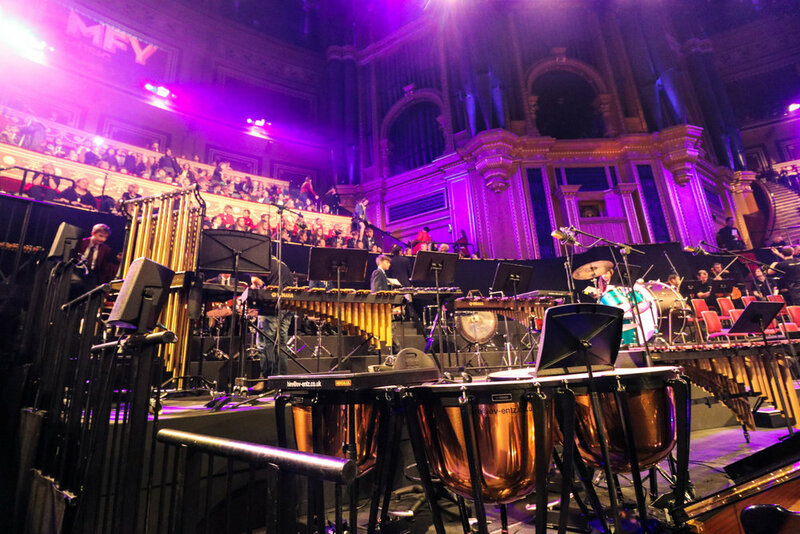 Inspired by the Royal Albert Hall performance, Southampton Music Hub will share the incredible new music from this magical event with schools across the whole city. On Tuesday 2 July 2019, two exciting massed playing events will celebrate a momentous end to an unforgettable year of music for the city. Taking place at Southampton Guildhall, each event will proudly share the exciting new music that has been created through the city’s Adventures in Time. 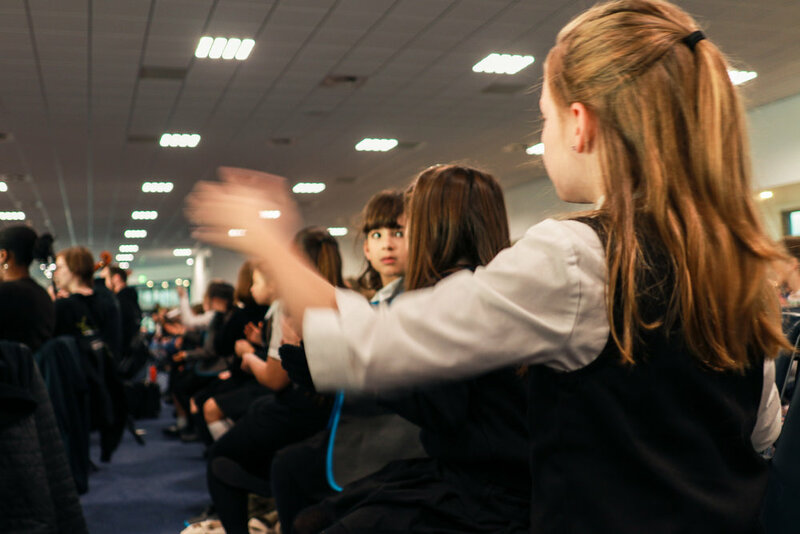 An interactive, massed playing, music celebration for pupils in KS1–2. Pupils will get ready for this exciting event with free resources and workshops in school. 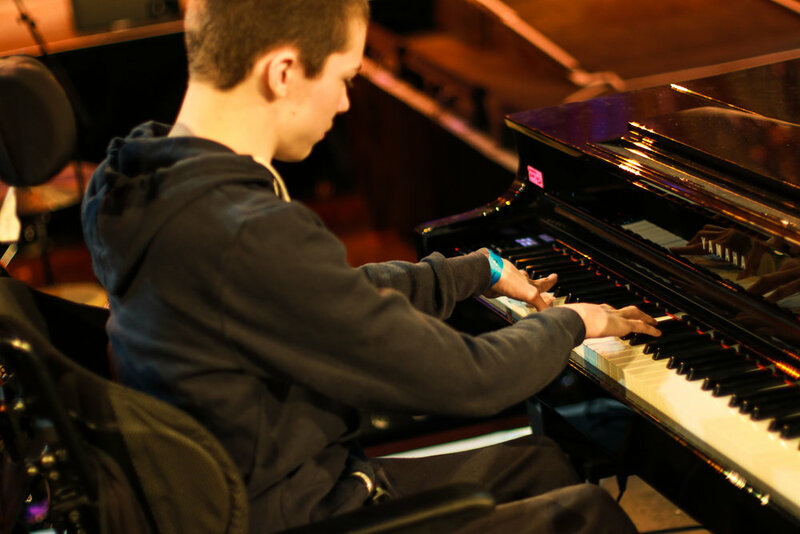 Because every young musician taking part in In2Music and SoundBites will also learn the music, this makes an ideal end to their first year of learning an instrument: inspiring them to believe they can achieve huge musical dreams. 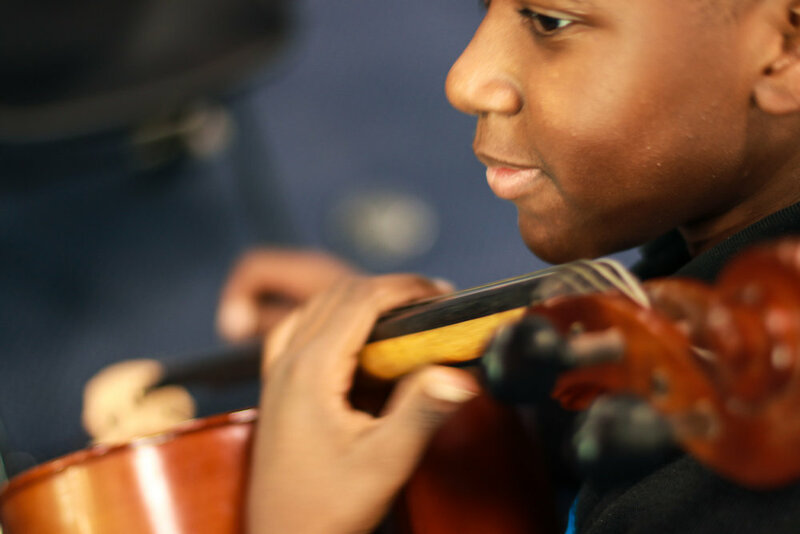 An evening celebration with Southampton’s young musicians and family music groups coming together with KS3–5 pupils to share music from, and inspired by, the Royal Albert Hall performance. Ways for families to get tickets, and be part of these celebrations will be announced soon. Following September’s successful return, Indian Classical Music Club, in partnership with Art Asia, continues on Friday 5 October 2018, with an evening of Indian Classical Music from 7-9pm at Cantell School. From its origins in South Asia, Indian classical music has a rich and deep history that stretches back hundreds of years and reaches across the world. Indian Classical Music Club helps everyone, whatever their background, to understand and enjoy Indian classical music. Chandra Chakraborty is an Indian vocalist with a melodious voice. She performs regularly in USA, UK, India, Pakistan and Bangladesh. She is the artistic director of one of the top three organisations in UK: Saudha, Society Of Poetry and Indian Music. Tofail Ahmed is a highly accomplished musician with several years of training and experience. He is a teacher, workshop leader and a remarkable performer of different forms of Indian Classical Music. A phenomenal and outstanding Tabla player, Sanju Sahai is well known for mesmerising and captivating his audience with his power, virtuosity and complete spontaneity. On the afternoon of Saturday 29 September, as part of Music in the City, families of all shapes and sizes came together in Guildhall Square, picking up a Bamboo Tamboo — many for the very first time — to play Caribbean music together. Led by Tom Gregory, percussion teacher for Southampton Music Services, the free, open-access workshops spread music right across the square, with new families joining in, and onlookers clapping along.